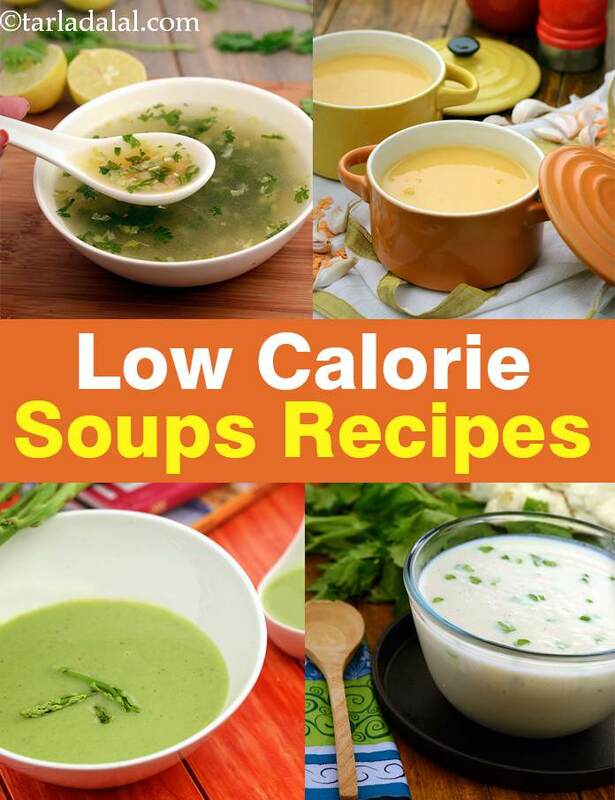 low calorie soups recipes. weight loss Indian soups. Here we bring you crunchy soup recipes that will help you maintain your waistline. These soups are nutritious and are low calorie too with healthy ingredients like low calorie vegetables, low-fat milk and does not contain unhealthy ingredients plain flour. Adding low-fat milk, curds or paneer will make your soups packed with protein. 4 tips to bear in mind for Low Calorie Soups. 1. To always try a new soup every day to avoid boredom. 2. Not to flavour them with calorie dense cheese and butter. 3. To make use of herbs and spices to tickle your taste buds. 4. To add a handful of sprouts to any soup to enhance your fiber intake further. You can make low calorie vegetable soups at home to have it as an appetizer either in lunch or dinner. Load yourself with the anti-oxidant beta-carotene from pumpkins with this Pumpkin Soup, a thick and luxurious soup which is also low in calories. There’s no cream added but it’s still creamy and tasty. Ever thought of combining two totally different vegetables like cauliflower and lettuce? Here we bring you a recipe of Lettuce and Cauliflower Soup that’s a combination of these tasty vegetables. A good recipe to top up your folic acid levels. Mushroom Soup will become your all-time favourite as it is brilliantly tasty with oregano added in it. It is quite filling due to the mushrooms in it, great texture and excellent source of Riboflavin, Calcium and Phosphorus to make your bones strong. Add loads of garlic to add a nice garlicky flavour to your soups along with adding health benefits of garlic. Garlicky Lentil and Tomato is a perfect toothsome soup along with a horde of antioxidants, fiber and protein! Masoor dal is perfect for Indian low cal soups. Masoor dal is rich in Folate, Vitamin B9 or Folic Acid which helps your body to produce and maintain new cells, especially red blood cells. Masoor dal is is good for diabetics and a healthy heart. So give a try to this amazing masoor dal soup recipe. Another protein rich soup we have is Masoor Dal and Paneer Soup. The use of low-fat paneer adds to its nutritive value and reduces the calorie content which would have otherwise come from regular full fat paneer. Add a bowlful of good health to your meals with this Moong Dal and Spinach Soup a zero oil recipe that is low in calorie and will give you a punch of Vitamin A, Thiamine and Folic Acid. The spinach paneer and dal soup is healthy and just 72 calories. Made with low fat paneer and yellow moong dal. Since paneer is low in carbs and high in protein it gets digested slowly and hence good for diabetes. Barley is diabetic and pregnancy friendly. A high fiber diet for years has been paired with reduced risk of heart disease. The fiber (2.73 g) from barley helps reduce blood cholesterol levels. Try this barley soup with vegetables and dal.